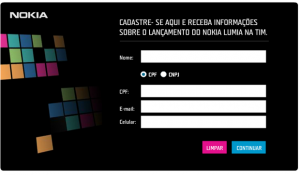 Brazilian mobile operator TIM has opened up pre-order registration for the expect Nokia Lumia 800 and Lumia 710 Windows Phones. At this point, TIM is the first Brazilian operator to open registration for these models, and also indicate that they will have them available. Sales are expected to begin on March 22, 2012. The Lumia 710 will run for BRL 1,000 and the Lumia 800 for BRL 1,800. You can register on the TIM website by clicking here. Hooray Brazil! If you live in Brazil and plan to get your hands on one let us know!